This weekend we went to Las Vegas to see my family. 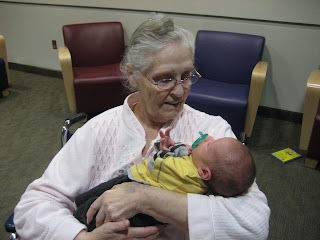 One of the main reasons we went was to meet Audrey, my sister Janae's new baby who was only 12 days old. She was so beautiful! 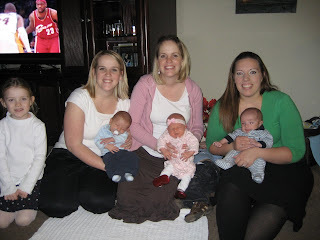 Here is a picture of Melissa my sister in law and her three month old Lucy, Janae my sister and her 12 day old Audrey and then me with Maddux who is a little over a month old. What's crazy is that my sister Olivia is due on Monday with twin boys and my other sister Janene is due this summer. We will have 6 cousins all around the same age! Can you belive it? We thought this picture was so funny. 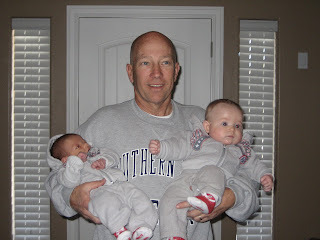 All the Dad's were watching sports and holding thier cute babies! 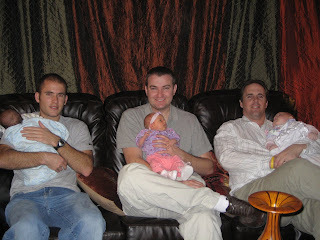 Greg and Maddux, Matt my sister's husband and baby Audrey, and my brother Ryan with his baby Lucy! I don't know if any of you remember the picture I took at Thanksgiving of my sister, me, and my cousin who were all pregnant...but here we are now all with our cute little babies. 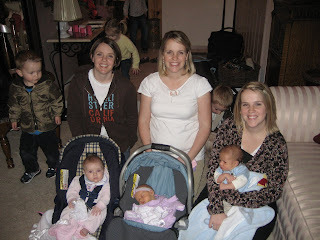 From the left is Brooklynn (Janae's oldest), me and Maddux, Janae and Audrey, and my cousin Andrea with her new baby Max. 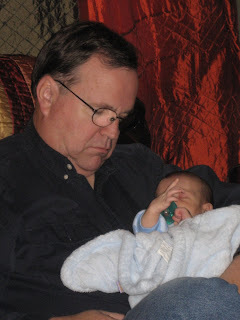 I just had to post this extra picture of my Dad with Maddux. Isnt' it so cute that they both fell asleep together? Maddux loved being able to hang out with both Grandpa and Grandma this weekend. He is so lucky to have them in his life! Maddux is lucky enough to still have great grandparents alive. He was able to meet my Mom's parents this weekend. I hope my other kids will have this oportunity too but with their health you just never know. 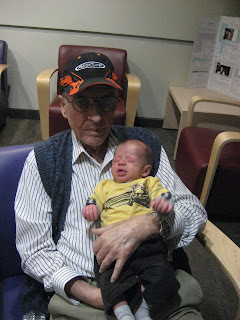 I am very close to this Grandpa so it meant a lot to me to have him meet Maddux. 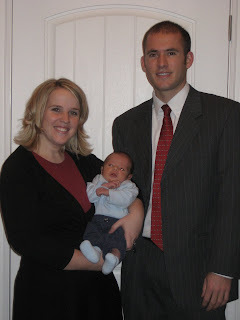 This weekend we decided it was finally time to take Maddux to church. He looked so cute in his little church clothes! He actually slept the whole three hours so it was a breeze... I am sure this won't always be the case so I am grateful he made the first experience easy on me. 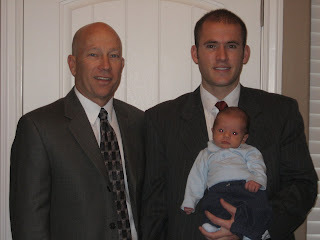 Three generations of Handsome Harris Men! 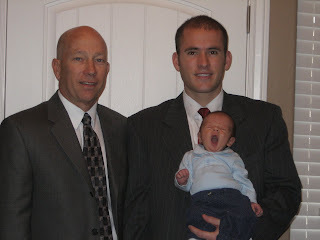 Maddux was obviously bored with the picture taking...Greg loves this picture! Grandma and Grandpa Harris, Taryn and Nate all came from California to visit us this weekend! We weren't able to go out much with both babies and the freezing weather...but it was so fun to spend time together. It was a weekend full of fussy babies, a half marathon, baby baths in the sink, Wii competitions, and lots of good food! 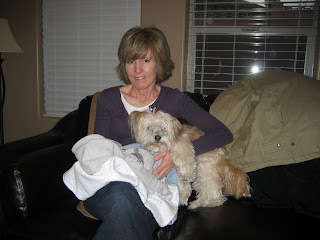 Here is Grandma Harris with Maddux and Boca...Boca loves Midge and gets very jealous when she is giving anyone else her attention. Taryn wanted pictures of Nate in the snow so Greg and his Dad went out in the freezing weather and built this miniature snowman for her in our backyard. It turned out so cute. It was also Maddux's first time out in the snow so we took pictures too. We think it looks like the snwoman is tickling Maddux's ear. This weekend Greg's sister Taryn and his parents came to visit. It was Maddux's first time meeting cousin Nate and Aunt Taryn. 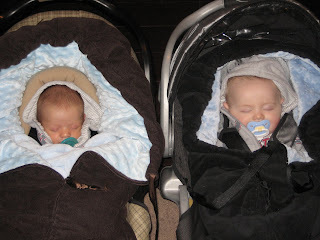 Here are our two sweet boys hanging out in their comfy carseat together. 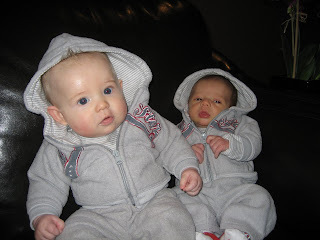 This was the only time we left the house...it's crazy how difficult it is to take two babies out. 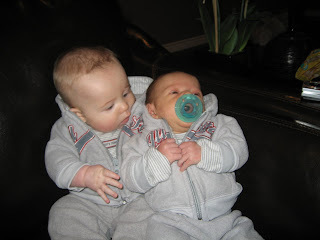 Grandma Harris bought both boys this cute outfit so we took pictures of them in it. It was not easy to get a good shot of both of them. We would have to give Maddux a pacifier in between pictures to hee him from crying. Nate kept looking at him wondering what was wrong. It was so cute. We had so much fun hanging out with Nate and Taryn... We wish they lived closer so we could see them more often. We can't believe how much fun it is to have Maddux in our lives. It seems weird that there was ever a time when he wasn't. Although our lifestyle has changed dramatically we are so happy! Here are a few pictures of how we spend our evenings now. Greg, Maddux and Boca just hanging out! 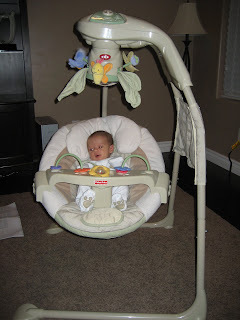 Maddux relaxing in his new swing! He loves it...aren't those pajamas so cute with the little puppy prints on the feet! Our first date night with a baby! After the holiday's, right before Greg had to return to work, our friends convinced us go out with them to dinner at Rusty's. I was so nervous about taking Maddux out. I was so sure he would get hungry or start crying that we almost backed out. But I am glad we didn't... it was good to see our friends and he was a perfect angle the whole time! Here we are at dinner with Merilee and Zane Jones, Kim and Dennis Almond, and our little family of three at the end. Maddux slept through the whole event. He was so warm and snuggly next to the fire place that he didn't even make a peep! I was relieved and thankful. The night we went home from the hospital. He was so tiny his newborn sized clothes were huge on him! First bath at home with the help of Grandma Spelts, Aunt Deidre and Daddy! Maddux wasn't sure he liked it! Maddux looks a lot like Greg...what a lucky kid! 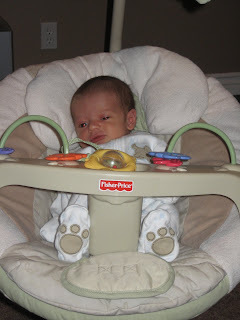 Maddux's favorite chair...Isn't this such a cute picture? His first few moments on earth! 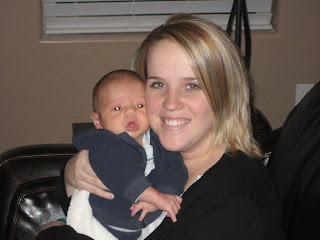 He was born at 7:14 pm on December 21, 2007. He weighed 7 lbs 13 oz and measured 20 inches long! Greg was a natural from the minute he arrived. I was exhausted (so we won't show you a picture of me) but so emotional and thankful that he made it here safely. Greg went with him to the nursery as they checked him out and cleaned him up. When they finally brought him back I couldn't believe how perfect he was! Greg and I both feel so blessed to have him in our lives. After my water broke they gave me an epidural and we figured that he would be arriving soon...we were so excited and ready to meet our little boy! Little did we know he wouldn't make an appearance until 7:14 that night. After 13 hours of labor and almost 2 hours of pushing he finally joined our family! We were so happy to have him here!! On Dec. 21st Greg and I woke up to a snow covered Cedar City! I was scheduled to be induced at 5:00 am so after Greg sholved the driveway at 4:30 in the morning we headed to the hospital.. It was very sureal. I couldn't believe it was actually time to meet my little guy. Greg and I were both nervous and excited to get things started. At around 11:30 am Grandma and Grandpa Harris arrived from California. 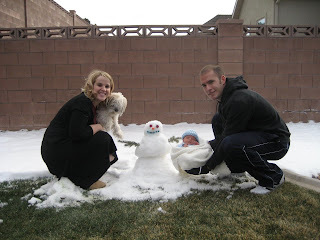 They were thankful to be out the snowy weather and we were excited to have family arrive. My progress was slow...I was still calm and relaxed and really hadn't felt much of anything. At noon my Mom and sister Deidre arrived from Las Vegas. They were also glad to be out of the yucky weather and I was so glad they were there! I had been waiting to see my Mom all morning. 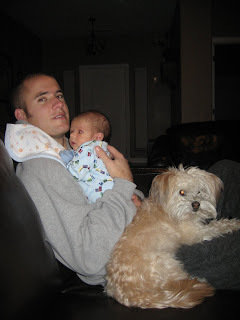 I still had not felt much of anything up to this point and I was wondering if Maddux was ever going to get here.